Designing for Melanie Muenchinger Week 2! Hi, everyone! Here I am in week 2 designing for Melanie Muenchinger! The cards I've made this week were just so much fun! 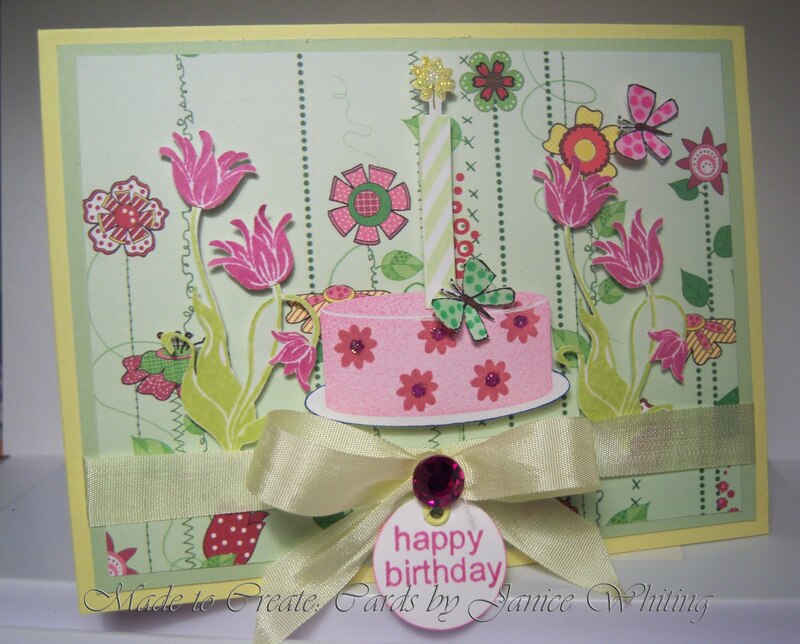 Of course, I used Melanie's newest stamp set "Candles on Your Cake." 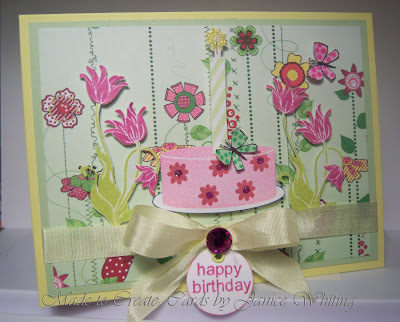 I used the larger of the two "cake" stamps and stamped the cute little flower on it to create the pattern on the cake. I used the bigger of the candles for a more dramatic effect and made sure to use the coordinating "flower flame" stamp. The sentiment also came straight from the set, I simply inked the "happy" and stamped it, then inked the "birthday" and stamped it so that the whole sentiment would fit in the tag. The flower images that are popped up came from the GinaK Designs "Spring Mix" stamp set and the adorable butterflies are also GKD, but from the "Dream Birds" stamp set. Beautiful card, Janice! Love the cheerful DP and the cute cake! Love your designs with Melanie's set! Just beautiful with the colors and images from all those stamps. You are doing great things with Melanie's set!! This is so pretty and love the dp you used on this! GinaK Designs--Seeds of Kindness Preview! Designing with Melanie Muenchinger Week 3! Celebrate with Strawberries on your Cake! Designing for Melanie Muenchinger Week 1!